Record Store Day 2019 exclusive release. Housed in a rough cardstock sleeve with stickers on both sides. Available for the first time ever"
My copy had some swirly surface level marking on it. Almost glassy. However, it sounds pretty good. Very quiet. I didn't really notice any audible issues. It's disappointing that the visual quality isn't better, but oh well. is there a difference between this and the european listing? 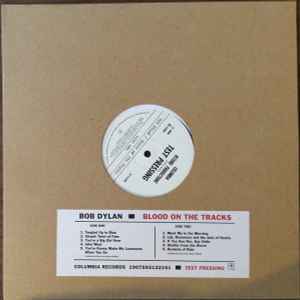 I’m not a Bob Dylan fan but this release is amazing. It also has me interested in more of Dylan’s works now. I bought it because the guy next time to me in line on RSD said it was going to be valuable. I bought it impulsively for $20 when the record store owner said the last copy was up for grabs during RSD. I’m so glad I did. I cleaned it first with groove washer and had no issues with sound or record quality. The best part about this release is that it is equally enjoyable as the originally released version but just different. Both versions stand up as impressive copies that are uniquely enjoyable. This is a real treat and one of the best releases of RSD. I'd say side A has its dings, swishes, and pops on the record I picked up. Cleaned it on the machine, helped by a small margin, pretty disappointing in the lack of consistent quality on this release. Most of the issues seem to be especially present during Idiot Wind. Side B is a lot better in comparison but still has some sound issues, it is also very flat so the record has those two things going for it. What a superb release, exactly what RSD is about. Can’t hear any issues on my copy at all, especially on those mentioned on A2 or A3. I wish the buttons on Bob's shirt were bigger and thudded harder against his guitar. Gimme that nice pearl-snap thud. These versions are great, I just wish the button noise wasn't there, it's a little distracting. For those that don't know, the odd clicking noises in some of the tracks is the buttons on Bob's shirt hitting the back of his guitar as he plays. My copy is flat and centred and doesn't have any clicks or pops. The sound is fantastic. Don't underestimate the demand, 7,500 copies isn't that much IMHO. 7500 copies were pressed, wait for the hype to die down and don't pay these inflated prices. Apart from a couple zipper sounds on the A-side this is an incredibly silent pressing. The mastering is excellent. It's a shame the pressing quality isn't better overall, but it's great to hear this material with proper presentation after years of listening to bootlegged versions.